Our trip to Florida is finally here, We’ve been in desperate need of a vacation. 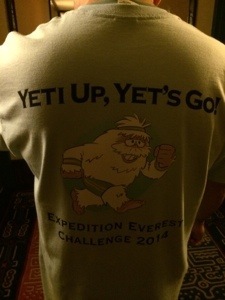 As a Christmas gift to my wife I had signed her up for the Run Disney Expedition Everest 5k Challenge. She’s become a runner, and has done several 5, 10k and half marathons, like there no big thing. Two of her races have been at Disneyland, and I know she really wanted to do a race at Walt Disney World. So I though what better then to sign her up. No I won’t be running, someone has to watch the kid while she runs. Pretty good excuse huh? I waited to book airfare, till after I gave her the gift. Just in case this was not her idea of a good time. I knew the running part would be easy since she can roll out of bed any morning and do 5k, before I even wake up. But I had no idea if the scavenger hunt part would be something that she’d be into. Thankfully she was up for it, and my gift was not a flop. Stay tuned for more about our trip. From planning a weeklong vacation at WDW, flying across the country with our almost three year old and even a few packing tips.